The Smoothwall must be connected to the Internet in order to discover, download and install system updates. Smoothwall’s support systems are directly integrated with the Smoothwall’s update procedure. 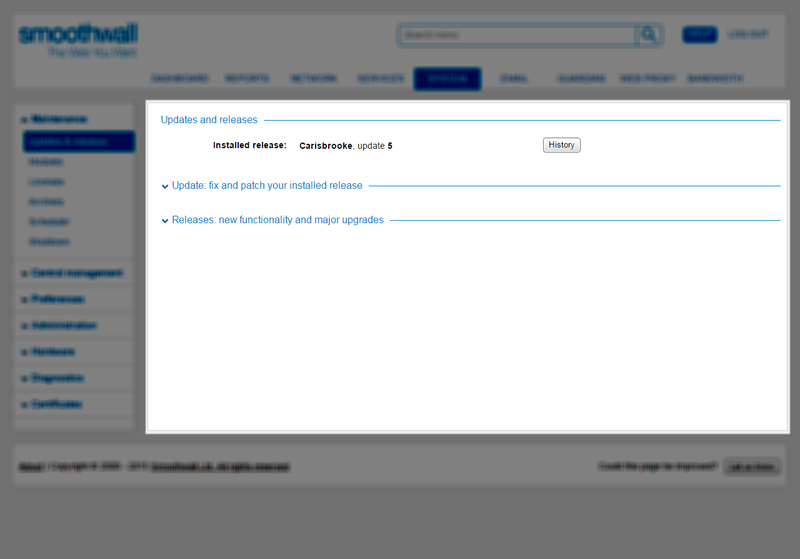 The Updates and releases panel displays the installed release for your Smoothwall. The History button brings up the release descriptions of all updates and releases included in your Smoothwall. Note: To prevent system corruption, the administration user interface is locked during the installation process. 1. Go to System > Maintenance > Updates & releases. 2. Expand the Updates: fix and patch your installed release panel. 3. Click Check for updates.to check for the latest available updates for the installed release. 4. Next update lists the latest update available for your installed release. • Use the Details button to view information about the changes included in this update. Note: The Smoothwall only displays the latest available update for the installed release, even if there are intermediate updates. This is because each update includes the previous one. 5. To install the update now, click Install. Details of the changes included are shown. When prompted, click Install and reboot. The Smoothwall reboots once the installation has completed. 6. To install the update at a convenient time within the next 24 hour period, click Schedule. a. From the drop-down list, select the required time. a. From the Automatically schedule updates drop-down, select the required time. Tip: The Smoothwall reboots itself upon completing the update installation, so it may be preferable to schedule an installation time. Note: If you are upgrading from a previous version of Smoothwall, you must reconfigure any saved scheduled updates. Note: A Unified Threat Management serial is required to configure a failover system. For more information, contact your Smoothwall representative. You must install the updates on the failover unit first; the master unit is blocked from updating until the failover unit either matches of supersedes the master unit's installed software version. Note: Replication between the master and failover unit is stopped until both are on the same installed release. 1. From the master unit, go to System > Maintenance > Updates & releases. 2. From the Updates: fix and patch your installed release panel, click Check for updates. 3. From the failover unit, go to System > Maintenance > Updates & releases. 4. From the Updates: fix and patch your installed release panel, click Check for updates. Details of the changes included are shown. 6. When prompted, click Install and reboot. The failover unit reboots to complete the installation. 7. Once the failover unit is live, install the updates on the master unit. While the master unit is rebooting, the failover unit is active and remains so until the master unit is live again. 2. Expand the Releases: new functionality and major upgrades panel. 3. Available releases for installation are listed in release date order, with the most recent being at the bottom. • Use the Details button to view information about the changes included in this release. • Like the updates, you can choose to install a release immediately or at a convenient time. Automatic installations are not available. 4. To install the release now, click Install. 5. To install the release at a convenient time within the next 24 hour period, click Schedule. Tip: The Smoothwall reboots itself upon completing the release installation, so it may be preferable to schedule an installation time.